Open the pages of the first issue of Massacre Magazine and release a plague of darkness. Over thirty thousand carefully crafted words from some of today’s most promising horror writers. 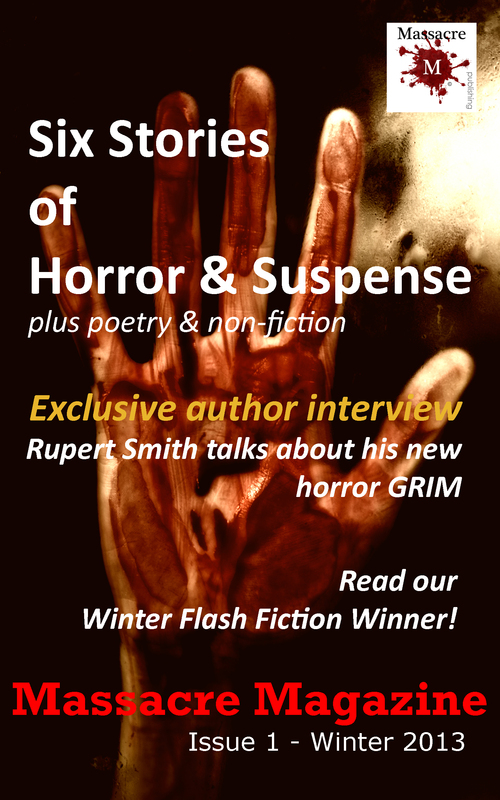 Bestselling author Rupert Smith talks about his first horror novel, GRIM, and the importance of community in tales of the mysterious and macabre. Matt Harrah asks Burning Questions in his flash fiction winner, and Jake Sheridan reveals what glides down mountains full of sin in his distinctive, The Voice. Marc E Fitch rolls up his sleeves for a bit of Savage Work. Talking of savage work, we have two very different twists on The Ripper theme in Paul Holbrook’s short story, Chain Me Not in Heaven, and a poem from Anthony Crowley. Jake Swan provides a warning to the desperate in There Are Worse Things Than Loneliness. Steve Emmett takes us to the German countryside in Head of the House, a simmering and atmospheric tale of sweet revenge. Sailing holidays will never be the same once you’ve visited Julia Kavan’s Safe Harbour, where reality and nightmare lap at the shore. Winter wouldn’t be complete without a Christmas story, but in Demon Darkling author Dana Wright provides more red than Santa’s suit. Our non-fiction contribution comes from Tracy Kuhn who takes exception to the theory that Horror is for Boys. This entry was posted in News, Publishing news and tagged Horror fiction, Massacre Magazine, Rupert Smith, Short story. Bookmark the permalink.